Open House, a consumer forum by Magicbricks, is a regular medium that addresses buyer’s and seller’s doubts and queries. Eminent panels of experts who have in-depth knowledge about the real estate industry, tax regulations and legal nuances in property deals provide advice to reader’s queries. With the proposed changes in the income tax laws by the Finance Minister, Arun Jaitley in his first Budget, Open House has been receiving many queries on the same, property sale, payment of taxes post sale of apartment in Mumbai, etc. Magicbricks gathered a list of questions and our expert’s answers which will benefit you if you intend to sell property in India. As per Magicbricks Tax expert Vaibhav Sankla director, H&R Block (India) Private Limited, opined that in case the property has been held for more than three years, the capital gains are classified as a long-term one. This means capital gains tax at the rate of 20 per cent after indexation becomes applicable. Sankla capsulated some basic rules that need to be adhered to while buying or selling property in India. Property registration is one of the foremost and important processes that both the parties; seller and buyer needs to come upon. Without finalizing the various important steps, you cannot be sure of the acquisition or selling of the given asset. Land, ready-to-move home or a property that is near completion, each and every property has to undergo the process. However, the registration process can be complex if proper attention is not given as India offers 2 different set of procedures for natives as well as for NRIs who want to mark their foray in Indian real estate market. The key purpose for which the Act was formulated and made a part of the law was to make sure that the information about all deals concerning property assets is correct. This straightaway ensures proper records and their maintenance. Further, the Act is used for accurate tracking of all the transactions associated with the immovable property. The sub-registrar who verifies and initiates the registration process needs to know the real market value of the property. It’s not only him but you as a property seller or the potential buyer should also be aware of the real market value. The value is that estimated by the Market Value Committee or consideration. If both the parties do not agree upon the set value then you are free to make an appeal to the District Registrar. Apart from this, you also need to have an idea of the ‘KHASRA’ of the plot/house from the sub-registrar or the registrar. This is one aspect that you need to know if you are planning to make an investment in a property. The property title includes knowing the origination of the asset; whether it is being transferred from the developer or the seller. This is required to be known by you otherwise if the title of the property is not clear and marketable then banks may refuse to support you financially. A bank or a housing finance company undertakes the due diligence process before it can approve the project and the loan. This very process also requires for the buyer to get a No-Encumbrance certificate from concerned registrar. The Sale Deed is another very important document that is formulated between the buyer and owner; developer may also come in, if applicable. You have to visit an authorized attorney to get the sale deed prepared and duly signed. The Schedule of the property has to be correctly mentioned in the Sale Deed and if any structure is situated over the landed property then that also has to be marked in the Sale Deed with the associated cost. It is very important for you to understand the fact that the property registration procedure varies from state to state. For instance, property registration in Mumbai and Ahmedabad is easier to a little extent than in Chennai. If you are planning to buy a house, land or putting up your house for sale in Chennai, then at both the sides the procedure is little elaborate. Unlike Mumbai and other Indian cities, you can obtain stamp paper from stamp vendors. This is otherwise an eased step in the procedure followed in other cities. This activity comes in action once the registration is complete. You have to apply to the local municipal authority in order to get the title of the property and get that transferred to your name. This is commonly referred to as mutation of the title of the property. The process today has gone completely automated and this has made the registration procedures, extremely easy. You can easily download the form online or can be obtained from the concerned authority’s office. If you are an NRI, then make sure that you have all the documents and identity proofs of the other country ready. Make sure that you are aware about the owner or the seller of the property and also that the asset is free of loans and liabilities or not. This goes for both, natives and NRIs. Before purchasing any property, you have to ensure proper research work and buy the asset through genuine and authentic seller, developer, brokers or agents. Never underestimate the effects of the feedback the local natives can offer you. The people residing in a particular area can very well tell you about the region and reputation of the seller. About 37 per cent of tenants in Chennai were looking for residential houses during Oct-Dec 2014 quarter, according to PropIndex, an India Apartment Index report by Magicbricks. A significant rise of 9 per cent has been noted in the demand for independent homes in the last three months. Porur, known for its chemical industries and manufacturing plants, is fast becoming an IT hub of Chennai. Companies such as L&T, HCL, IBM, Dell, iGate, Logica, Barclays and several others have set base in the nearby DLF IT Park while TCG IT Park and Jayanth Tech Park are currently being developed. Rental values in the locality start from Rs 6,000 per month for a 1BHK house and go upto Rs 20,000 per month for a 3BHK villa. The area is situated at the key junction of Mount-Poonamallee Road, Arcot Road and the Chennai Bypass Road. It is also just 12 km from the Chennai International Airport. “Developing IT Special Economic Zones (SEZs) in the nearby region and the recent arrival of small companies make the area a favorable option for the workforce, primarily from these companies and industries,” says Usha Sekar of Hi Tech Foundations, a broker firm. Porur’s neighboring locality Ramapuram also offers several leased residential houses. Here, rental values vary from Rs 6,000-18,000 per month for 1-3BHK units. The area being situated along the Mount- Poonamallee Road shares the same neighborhood as that of Porur. Poonamalle, situated along the Outer Ring Road (ORR), is comparatively affordable than Porur and Ramapuram. The locality offers 1BHK houses on a starting rent of Rs 5,000 per month while 3BHK bungalows are being leased for Rs 12,000 per month. With ORR Phase -1 becoming functional in September 2014, several projects and townships have come up in the vicinity while schools and colleges are already present. “The area is rapidly developing and is very near the proposed Greenfield Airport. It is surrounded by renowned schools,” says Hemanand, a resident of the locality. So, if you are looking to rent a house in Chennai, you know where to start your search. Source: Times of India Chennai /Ankit Sharma is a real estate writer with Magicbricks having a knack for property trends and latest updates on the sector. Managing a property takes quite a bit of work. Paying property and water taxes, doing routine maintenance, finding tenants, attending to emergency calls from tenants about clogged drains or leaking roofs can all add up a lot of time. Even more so if you are abroad or do not live close to your property, as was the case with R Sourirajan. He rented out his apartment in a prime location in Chennai and moved to his native town. He found himself having to make multiple trips to the city for various issues. So he took the help of a property management service. For a fee, these companies act on your behalf in handling various demands that come with property ownership. Property maintenance providers offer both year-round services for tasks such as routine maintenance, as well as one-time work, such as finding a new tenant. “We keep track of annual maintenance contracts for the amenities in the property,” says K Chandrasekar, Founder and Managing Director of Rajam Property Management, a Chennai-based service provider. Even when rendering one-time services such as finding new tenants, companies go beyond the services provided by a broker. “We have coordinated wood work and electrical fitting completion for empty flats and made them ready to be rented out,” says Anu, the Founder of Bangalore-based Trust Property Management Service. These service providers also conduct background checks on prospective tenants and draft the rental agreement. Once rented out, they deal with issues reported by the tenant; they also inspect the premises periodically to ensure it is well maintained. When a tenant vacates, the house is checked to ensure that the inventory of items listed in the rental agreement, such as fittings, are in proper condition and there are no payments due for services such as cable. Additionally, these companies maintain a financial record of receipts and payments related to the property. If you own a plot of land, the property management firm would undertake regular visits to ensure there is no encroachment and update you on any developments in the locality. Homeowners must enter into an annual agreement with the property management firm. The fee charged by the company for routine management, which includes paying taxes and other dues, regular upkeep and tenant services, ranges from 4-12 per cent of the income from the property. Alternatively, a flat fee is charged, in case of land or if the property does not generate income. Locked up property is charged on a square foot basis and taking into account notional rent. You can negotiate a lower fee if you use the company’s service for multiple properties. There are additional charges for services such as finding a tenant, which are not considered part of routine management. This fee can be 50 per cent of the first month’s rent or as high as 10 per cent of the lease amount, notes Gaurav Yadav, Director, Uday Homz, a Gurgaon-based property and real estate consultant firm. Repair and routine maintenance work, such as painting, are billed at actual. The company gives you a quotation of the costs and gets your approval before starting the work. As costs can quickly add up, it may be tempting to choose a company that charges the lowest fee. But be sure to consider a host of other factors. First, get an idea of the provider’s experience in that locality. You must also ensure that the company has handled properties similar to yours. For instance, high-end villas require a different skill set than mid-priced apartments. Second, assure yourself of the provider’s service quality. Visit a few properties maintained by the company and talk to the tenants to know how responsive the provider was to issues. Ask the company what the typical charges are for plumbing issues such as fixing a leaky tap, to evaluate if it is reasonable. Third, spell out clearly what services are covered under the contract. For example, will the company make note of housing society rule changes? Get the fee terms in black and white instead of assuming it is included in the routine service price. Fourth, know the contract termination terms. Find out if there are any fees in the event of your cancelling the contract ahead of its term. Last, but most importantly, ensure that the service provider is trustworthy, says TL Sankarnarayan, who is one among the many customers using property management services. Looking for rented apartments in Chennai? Try searching them in the central chennai zone. According to PropIndex, an India Apartment Index report published by Magicbricks, localities such as Anna Nagar, Kodambakkam and Nungambakkam, situated right in the heart of the city, offer maximum options to the tenants. Check out properties in Chennai! Planned by Tamil Nadu Housing Board (TNHB), Anna Nagar is divided into various avenues. The redevelopment has increased the stock in the area with independent houses paving way for multi-storey and builder-floor apartments. Rental values of 2BHK apartments range from Rs 10,000-25,000 per month while a 3BHK unit is being leased out for Rs 25,000-75,000 per month. “Tenants living here have the benefit of living close or connected to all important places in the city,” says Abdur Ravoof of Green Global Realty. Anna Nagar is situated about 6 km from SIDCO Industrial Estate of Ambattur, 16 km from International Airport and 10 km from Central Railway station. Kodambakkam is another locality with a high supply of leased apartments. To rent a 2BHK apartment in Kodambakkam, one has to pay Rs 13,000-27,000 per month. Rental values of 3BHK flats on the hand start from Rs 22,000 per month and goes up to Rs 26,000 per month. However, tenants must be aware of traffic issues the locality faces. Existing roads, flyovers and bridges in the area are not adequately equipped to meet the volume of vehicles in the area causing long traffic jams. Home to several government offices, retail outlets, hotels and restaurants, Nungambakkam is home to the elites of the city. “Nungambakkam is one of the oldest and well developed localities of Chennai. It has no water or sewerage problem and has easy connectivity to all important places,” says Velmurugan V of Gentleman Real Estate, a broker firm. Rental values of 2BHK units range from Rs 15,000-35,000 per month while a 3BHK apartment is being leased out for Rs 30,000-70,000 per month. Few 1BHK apartments are also available here in the price range of Rs 8,000-15,000 per month. Source: Times of India Chennai / Ankit Sharma is a real estate writer with Magicbricks having a knack for property trends and latest updates on the sector. 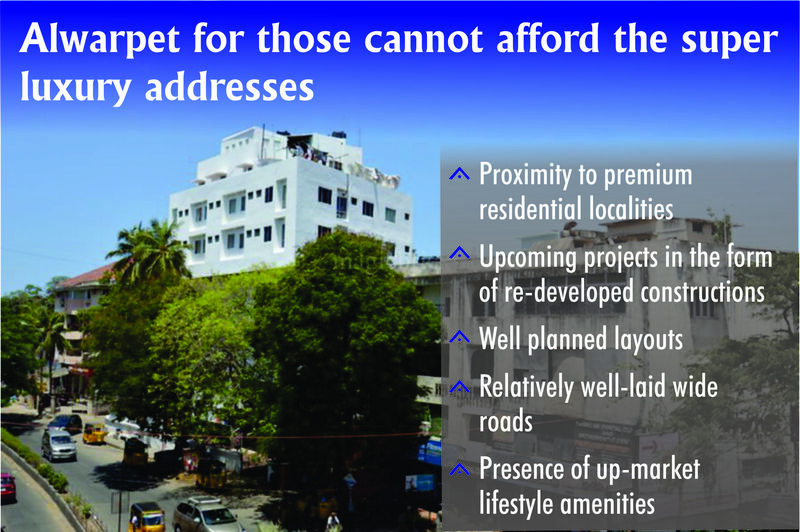 Currently, Chennai’s real estate market is witnessing an interesting trend. Demand for 1BHK units, whether it is for sale or rent, is high in comparison to its supply across the city, according to PropIndex (Oct-Dec 2014), an India Apartment Index report published quarterly by Magicbricks. This situation of low supply against high demand for 1BHK properties can be beneficial for investors with a limited budget looking to earn profit. According to Magicbricks data, capital values of 1BHK units in the city start at Rs 9 lakh while the rental values begin at Rs 3,000 per month. Areas with high supply of 1BHK units for sale include Kolathur, Korattur, Perambur, Thirunindravur, Medavakkam, Pallikarnai, Tambaram West, Urapakkam, Kundrathur and Porur. Check out prices of 1BHK units in Chennai! Prices of 1BHK units in Medavakkam range from Rs 20-45 lakh, with covered area varying from 500-1200 sq ft. Similar units when put on rent can earn you monthly income of Rs 5,000-12,000. The area falls close to IT companies situated along the OMR and Shollinganalur, hence the rental demand generated here is by the IT professionals. “Most of these people are from outside the city, hence look for rented properties. The investors market is driven by this demand along the OMR,” says Duraisamy Nadar, a local realtor active in the region. In Porur, 1BHK units are being sold for Rs 17-49 lakh with covered area ranging from 400-600 sq ft. Rental values for similar configuration varies from Rs 6,000-10,000 per month. Situated in the western zone, Porur is home to several IT companies, chemical industries and manufacturing plants. Workforce employed in these companies and industries generally look for properties here. The city as a whole has 34 per cent demand for rented 1BHK units, while its supply is just 11 per cent. Similarly, demand for 1BHK properties on sale is 11 per cent while its supply is 7 per cent. If the current situation persists, a rise in rental values can also be expected in coming months. So, if you are looking to earn rental income but have a low budget, try investing in 1BHK units. If you would like to live in a posh area but do not have sufficient funds to afford one, Alwarpet in Chennai is an excellent option for rental accommodation. In fact in the Jul-Sep 2014 quarter the rental prices in the area witnessed a significant fall of almost 23 per cent for multi-storey apartments, compared to the same period in 2013. Subsequently, in the Oct-Dec 2014 quarter rental values picked up by about 15 per cent. Find homes on rent in and around Alwarpet! “Secondly, most of the upcoming projects are re-developed constructions of large sites (some even combined sites), originally inhabited by middle-class people, who today, are aiming at getting regular income,” adds Kumar. In fact, Alwarpet has been the recipient of several focused facelifts in the past few years. Well planned layouts, relatively well-laid wide roads, presence of upmarket restaurants and lifestyle amenities have ensured of rendering this location as the most preferred for rental abodes. Alwarpet is connected to almost all major parts of the city, is near the Chennai Central Railway Station and is about 14 km from the airport. As per Magicbricks data, approximately 55 per cent of the available stock in Alwarpet comprises of builder floors, while about 35 per cent of the inventory is of multi-storey apartments. The rest comprise of independent houses and residential plots. Currently, the rental values in the area hover around Rs 37,000 per month for a 2BHK with a carpet area of 1000-1200 sq ft. A 3BHK builder floor, on the other hand, commands a monthly rental of around Rs 40,000-45,000, complete with tree lined compound walls and large private sit-outs. Source: Times of India /Kanchana Dwarakanath is an integrated communications professional with diverse experience in journalism & Marketing Communications. Her current focus areas include real estate, infrastructure, urban management and the skill development market.